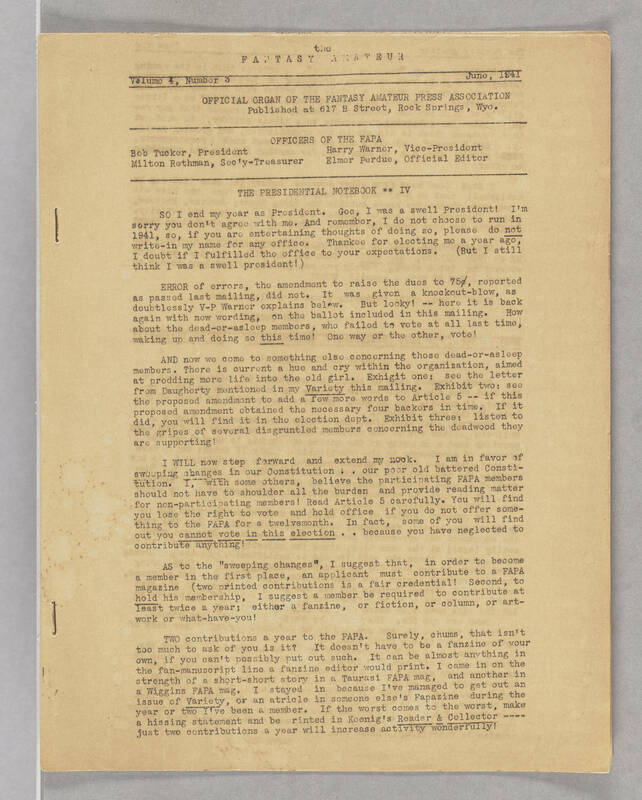 the F A N T A S Y A M A T E U R [line across] Volume 4, Number 3 June, 1941 [line across] OFFICIAL ORGAN OF THE FANTASY AMATEUR PRESS ASSOCIATION Published at 617 B Street, Rock Springs, Wyo. [line across] OFFICERS OF THE FAPA Bob Tucker, President Milton Rothman, Sec'y-Treasurer Harry Warner, Vice-President Elmer Perdue, Official Editor [line across] THE PRESIDENTIAL NOTEBOOK ** IV SO I end my year as President. Gee, I was a swell President! I'm sorry you don't agree with me. And remember, I do not choose to run in 1941, so, if you are entertaining thoughts of doing so, please do not write-in my name for any office. Thankee for electing me a year ago, I doubt if I fulfilled the office to your expectations. (But I still think I was a swell president!) ERROR of errors, the amendment to raise the dues to 75¢, reported as passed last mailing, did not. It was given a knockout-blow, as doubtlessly V-P Warner explains below. But looky! -- here it is back again with new wording, on the ballot included in this mailing. How about the dead-or-asleep members, who failed to vote at all last time, waking up and doing so this time! One way or the other, vote! AND now we come to something else concerning those dead-or-asleep members. There is current a hue and cry within the organization, aimed at prodding more life into the old girl. Exhigit one: see the letter from Daugherty mentioned in my Variety this mailing. Exhibit two: see the proposed amendment to add a few more words to Article 5 -- if this proposed amendment obtained thenecessary four backers in time. If it did, you will find it in the election dept. Exhibit three: listen to the gripes of several disgruntled members concerning the deadwood the are supporting" I WILL now step forward and extend my neck. I am in favor of sweeping changes in our Constitution . . our poor old battered Constitution. I, with some others, believe the participating FAPA members should not have to shoulder all the burden and provide reading matter for non-participating members! Read Article 5 carefully. You will find you lose the right to vote and hold office if you do not offer something to the FAPA for a twelvemonth. In fact, some of you will find out you cannot vote in this election . . because you have neglected to contribute anything! AS to the "sweeping changes", I suggest that, in order to become a member in the first place, an applicant must contribute to a FAPA magazine (two printed contributions is a fair credential! Second, to hold his membership, I suggest a member be required to contribute at least twice a year; either a fanzine, or fiction, or column, or artwork or what-have-you! TWO contributions a year to the FAPA. Surely, chums, that isn't too much to ask of you is it? It doesn't have to be a fanzine of your own, if you can't possibly put out such. It can be almost anything in the fan-manuscript line a fanzine editor would print. I came in on the strength of a short-short story in a Taurasi FAPA mag, and another in a Wiggins FAPA mag. I stayed in because I've managed to get out an issue of Varity, or an atricle in someone else's Fapazine during the year or two I've been a member. If the worst comes to the worst, make a hissing statement and be printed in Koenig's Reading & Collector ---- just two contributions a year will increase activity wonderfully!